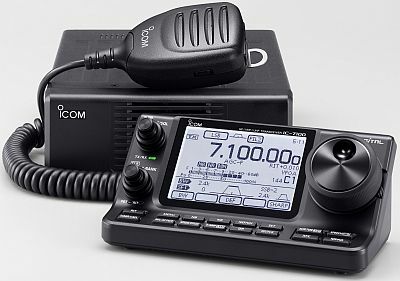 The new ICOM IC-7100 is a 100W transceiver for short wave, 50MHZ, 70MHZ, 144MHZ and 430MHZ with remote control panel, D-Star and touch display. At first the new 48.6mm x 75.9mm wide Touch Screen falls on on this transceiver. Contrary to the IC-7000, this is not in color on the IC-7100. The most important functions can be quickly and easily accessed by directly touching the menu items on the display. Also, the input frequency can be done directly on the display with a keypad that appears. The Control Panel has for the first time a form to get it right on the the station table. The display is arranged obliquely here. Additional brackets to read the display properly are not necessary. When mounting in a car optional brackets are available. On the dashboard or center console allows the control panel mount with this intuitive and does not distract the attention of the driver. In addition to the touch panel can be found on the front panel the necessary buttons and controls. The microphone is connected direct on the rear side of the control panel. A loud, powerful speaker located on the back of the control unit. The Transmitter sweeps all shortwave bands from 160m to 10m and in addition 50 Mhz with an output power of 100W. At 70MHZ and 144 MHz, the IC-7100, has an output power of 50W and at least on 70cm delivers the transmitter 35W Output. A 32bit IF-DSP in the Receiver works in the shortwave bands, on VHF/UHF too and provides the functions such as PBT, Noise Reduction, CW autotune and more. The receiver operates continuously from 0.03 - 199.999MHz and 400 - 470MHz in all types of modulation (WFM RX only). In the IC-7100 all components for D-Star operation are already installed. The device has an internal repeater list, which can be accessed quickly and easily through the touch panel. With an external GPS receiver, the IC-7100 can also automatically select the nearest relay from that list. Easier and more comfortable as it gets almost. Ensure that all settings are always available, the IC-7100 provides the ability to save the settings to an SD card. For the digital modes, the IC-7100 is through its diverse connectivity options the ideal companion. Besides the classical CI-V interface is even including a USB port for connecting to the computer. Furthermore, is with the optional remote control software RS-BA 1, a tool available to completely operate this transceiver remotely and over the Internet.